This small dwelling is designed to take its place in a vast landscape - a lightweight timber structure inspired by the working buildings of the local, rural environment. The house is conceived as a folded ribbon of timber which emerges from its site, then folds back on itself to form an enclosure in a manner which both 'grounds' the building and amplifies its presence in the broader landscape. Openings in the ribbon are formed for access and view. On the southern side, the façade is closed down against southerly weather. A single opening, accessed by an inclined 'sheep chute' signifies the entry. To the east and north, a continuous articulated strip of windows and doors frame views, moderate sun penetration and provide access to the northerly semi-enclosed deck. Rough sawn timber installed in a traditional batten and board manner has been used as the predominant external cladding, in reference to context and for economy. The visual texture of this material at a broader landscape scale gives way to smoothness and careful refinement in detail at the personal scale. 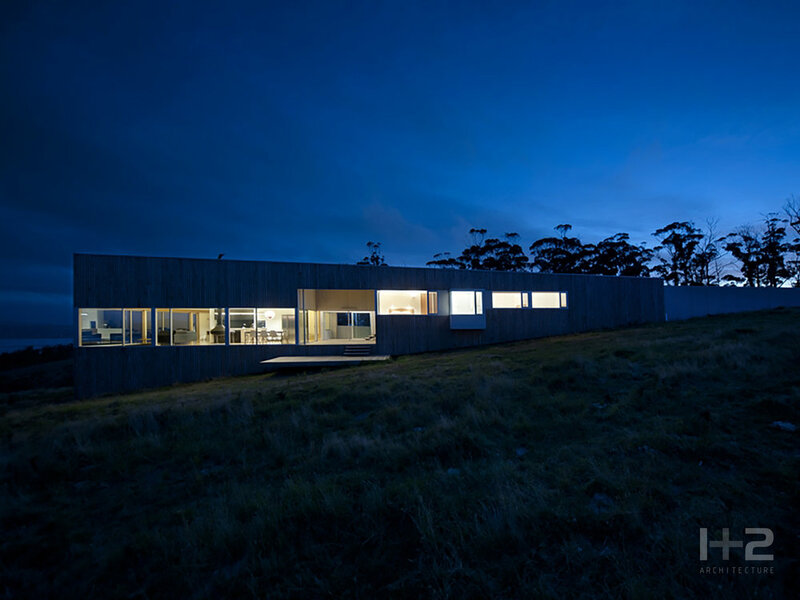 The interior is a composition of warm whites and natural timbers in keeping with the Danish owners sensibilities – a holiday haven immersed in the Tasmanian landscape. 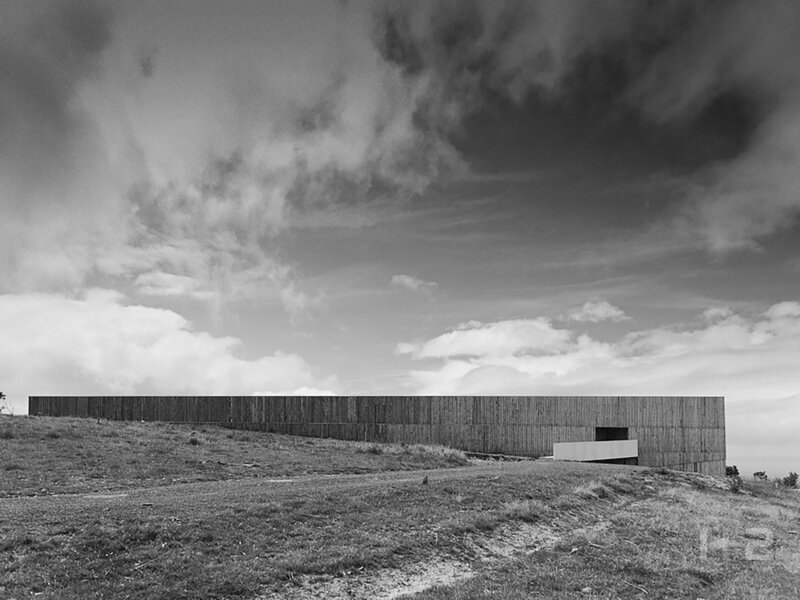 “The massive timber wall, necessarily over-scaled to have any presence on the open hillside, elicits the visitor’s intrigue. That which is ‘contained’ is much smaller, crisply detailed and glassy on the leeward side but does not disappoint. The panorama of landscape and ocean is both generously revealed and selectively framed. A roof, falling consistently and gently against the slope, softly compresses the uphill, cosy family quarters, leaving the higher ceilings for the dramatic entry and living spaces. Simultaneously, in this isolated and often hostile environment, the building must offer a sense of security and self-sufficiency. Here the sustainability features, from services to structural systems to interior finishes, are at work and remain integral to the building architecture without distraction. The big wall, clad in unfinished macrocarpa that will weather to a silver grey, remains the identity and anchor of the project - offering protection and the silent, dependable embrace within which occupants will nestle”.